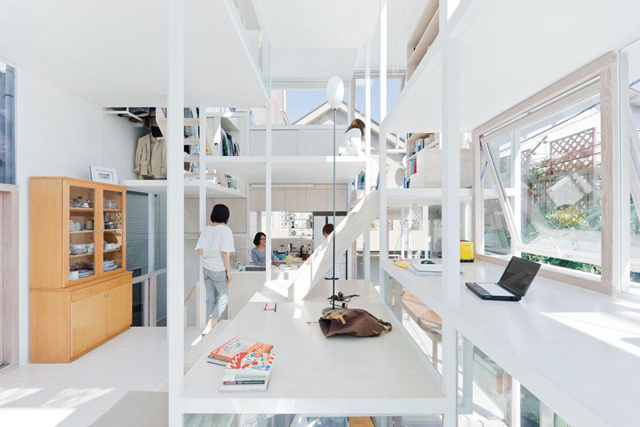 We have been fascinated by the works of Japanese architect Sou Fujimoto for quite some time now, but his most recent NA House in Tokyo is beyond captivating! The multi-level home is based on a split-level steel frame construction with transparent glazing, but without a full set of stairs, yep, rub your eyes and re-read the previous statement. The Na house is formed of levels, close to one another - steps. Fujimoto also added movable furniture which can double as steps when put into certain locations. The idea of the home is that each generic surface can be used for numerous functions; a desk can become a table, bench, or even a bed!